1 Bed, 1 Bath In Family-Friendly Neighborhood. Walk To Long Sands In 7 Minutes. Family-friendly, one floor vacation rental. Only a brisk 7 minute walk to Long Sands Beach, York, Maine. Sleeps 4. Enjoy waking up in your private bedroom with a KING size bed, with the kids on the extra converted full size futon. Living room has 30" cable TV with nearly 2000 channels. but you won't need the TV, because the beach at Long Sands is only minutes away!!! Electric range and oven in the kitchen. Linens, towels, and all kitchen essentials provided. New washer and dryer on premises. We are pet friendly. We ask for a non-refundable pet fee, per pet, of $75. Small dogs only please. Due to insurance liability reasons, we cannot allow pit-bulls, rottweilers, dobermans or any known mix there of. Please always pick up after your best friend and please keep on a leash when outside the house as to not disturb other guests. The town of York has noise ordinances in place for dogs left barking, howling, and/or whimpering inside a home. Neighbors have been known to call the animal control officer with complaints. This may result in the dogs owner being issued a summons to appear in court at a later date. There are numerous doggy daycare centers in the town of York, and surrounding towns for your dogs daily enjoyment. From May 15th to September 20th, dogs are allowed on York beaches after 6:00pm and before 8:00am. Be sure to check the towns website for more detailed information and local ordinance updates. 4 Paul Street is a NO SMOKING PROPERTY. No exceptions. Please be considerate of other guests. Evidence of smoking IN or ON any part of the property is prohibited and will result in immediate dismissal of a guest's stay. Thank you. Cute bathroom with shower (no tub). Window air conditioner in bedroom. Floor air conditioner in living room. Ceiling fan in living room. On premises. New washer and dryer to be installed. One car garage available for additional storage upon owner request. Cute basic beach kitchen with electric stove, refrigerator, and all the kitchen essentials. Board games. Poker table top available. 5 or more night stay, housekeeping done mid-week. Cottage was lovely, clean and comfortable. We had a lovely visit at the mermaid cottage. It was clean and very comfortable. A very convenient walk from the beach. Bed very comfortable. Kitchen was sufficient for our stay. We had a heating issue, however the owners were quick to respond and ultimately fixed the issue. 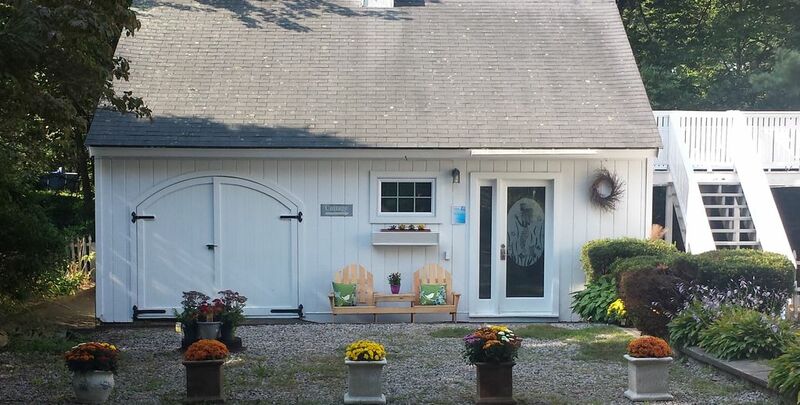 Cute cottage for the perfect weekend getaway! We absolutely did! We had a great time on the beach with the dogs! We had to leave early on Wednesday due to my daughter being sick! We were hoping to go back on the beach Wednesday! Your cottage is very cozy! !